For many years our old former farmhouse was a sort of dusty rose shade of pink. I had finished painting it gray to match the siding on the new addition in the back just in time for the fire. Maybe it was meant to be pink, I don't know. A couple of random strangers actually told me they wished we had left it pink because they used it as a landmark when they gave directions. It definitely was a rather unique color. Anyway, I'm very sad to say that part of our house is gone now. It was around 130 years old and I still miss it. We keep our old house in mind constantly as we work on the new version of it - sort of in an attempt to have the spirit of the old house move over into the addition which has become our new house. That sounds weird, but that's how it is. 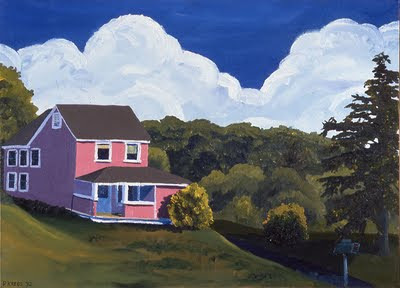 Last week a person who lives in my area saw an earlier post I'd made and he then saw a picture of my house and realized that he had a painting of the old pink version of it hanging in his house! His brother, an artist who works in New York and Charlottesville, had painted a picture of our house, unbeknownst to me, way back in 1992 when he was still a student. He had just returned from studying in Arles and the painting reflects that influence a bit. And he has really captured the feeling of an earlier time. I am so happy that this painting exists and I'm very excited about the prospect of being able to see it in person sometime soon. I guess this is an example of one of those amazing random connections that occasionally happen in the world of blogging. And now Peter Krebs, the other painter of my house, has written a wonderful piece on his blog about his experiences growing up in this area and why he decided to do this painting. It's a beautiful story and beautifully written as well, so please go read it. It will warm your heart. Bring it on! I'm ready. The worst snowstorms are the little ones that make the roads slippery and tie up traffic. The best snowstorms are the big ones that pretty much eliminate traffic. I am really looking forward to the quiet that snow always brings. The world always feels so peaceful when there is snow on the ground. 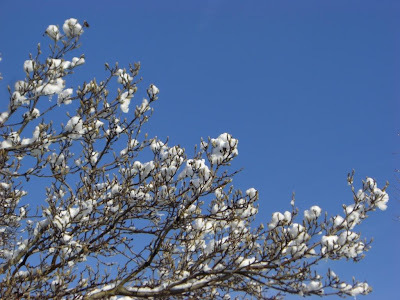 And in honor of tomorrow's weather I hope you'll enjoy this extremely lovely version of "Snowfall" as sung by the Manhattan Transfer. Thank you, Washington Cube, for suggesting that I go listen to this beautiful arrangement! You have perfect timing. Today was an excellent work day over at the house. We've been working outside on our back porch all week and it's been mostly miserable working in the freezing cold. But today it was warm and we got a lot done. Our back porch is finally finished, except for the fans. As soon as all of the construction materials are cleared out of there I will post some pictures over at FoamCoreFantasy. When Doug takes a break from working to answer the phone, I'm often left with nothing to do since it is my "job" to be at his beck and call. So I go off and take pictures to keep myself from going crazy with boredom. Fortunately I am easily amused as I wander around my house and yard, wondering if we will actually ever get to live there again. This fall I installed a whole bunch of knobs. The cabinets seem quite pleased to have received their eyes and mouths. The outlets on the other hand, are somewhat worried because the electrician has not been here for at least a month even though there is plenty of work that still needs to be done. I discovered a fox living in the floor of our spare bedroom! And a man on my right shoe. These shoes have been through a LOT. I've washed them about six times, although obviously not recently. Lots of grass stains and paint there. I hope they hold out until we finish our house. Moving out to the backyard, Kermit the Komposter was looking a little pensive today. I was going to give him a little more to eat but he hasn't digested last week's food yet. Hey, speaking of food, what's on that dead tree over there? Schrooms! With ice caps on the mushroom caps. The snow still hasn't melted in the shady spots. Well fortunately my hallucinogenic powers are fully functional without any additional help, so I'll just leave those for the deer. I am also wearing a happy face because I have three gigs tomorrow, which means I have a day off from sawdust, dirt, and exhaustion. But if it looks like it looked today every now and then, I'll take it. It was a winter wonderland out there this morning as I drove to Damascus to play the Bach cantata "Wachet Auf." I spent most of the day in church today. But I had an hour at home this afternoon where I took these pictures of the magnolia tree near our parking lot. 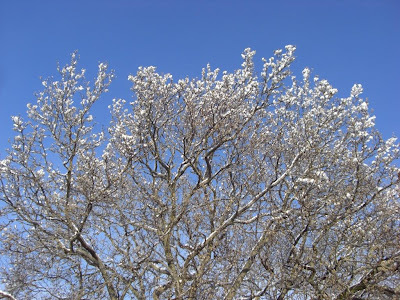 I love this tree - it is beautiful at all times of the year. Today it looked like it was decorated with cotton. This afternoon and evening I played two performances at a church in Glen Burnie. The show was sort of a 1940s Radio Hour meets church Christmas musical kind of thing - a very nice production with a large cast, big band, and string section. 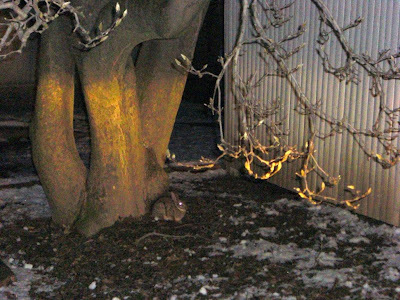 And when I got home tonight this little rabbit was waiting for me under the magnolia tree.